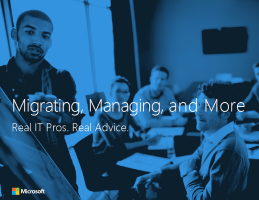 Download it to learn how your peers in IT are dealing with the challenges and opportunities from migrating business applications to the cloud, and how to use cloud computing to improve business performance and competitiveness. It is not a question any more whether or not businesses are moving applications to cloud platforms, but how quickly IT can manage the migration. Business applications are no exception. Competitive pressures are driving IT professionals to take advantage of cloud infrastructures and to integrate cloud on top of their existing environments. IDG Research Services, in conjunction with Microsoft, recently surveyed 55 IT pros—from a wide range of industries—who have deployed enterprise business applications to a public or hybrid cloud to produce this insightful eBook. All respondents are deeply involved in the purchase or implementation of third-party cloud solutions.